As my kids get older, I'm finding it harder and harder to buy birthday presents for their friends. Tween girls? That's hard. 4th grade boys? Also hard. But thankfully, these three books are a total slam dunk. My son (10) refers to and looks at all three on a regular basis. I've given them -- individually or together, depending on the birthday giftee -- more times than I can possibly count. I've personally read all three, and they are terrific. 1. 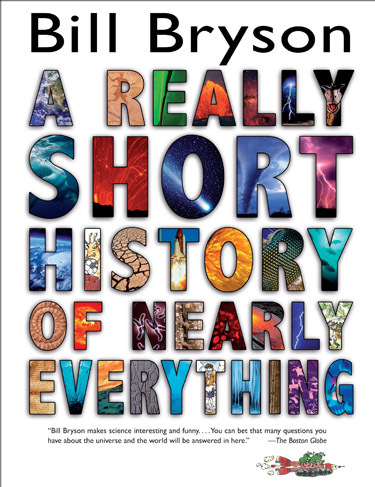 A Really Short History of Nearly Everything. This is a shortened, illustrated version of Bill Bryson's famous, hilarious, and insightful book about science. In the introduction he reveals his bias towards wonder and his enthusiasm about understanding the world: “There isn’t anything in existence—not a thing—that isn’t amazing and interesting when you look into it.” This book is both entertaining and hugely informative, and both my son and I adore it. 2. Unbored: The Essential Field Guide to Serious Fun. This book, by Joshua Glenn, is probably my son's favorite book. Ever. It taught him how to shortsheet a bed and how to do parkour in the backyard. Glenn manages to make projects -- particularly those in the real world -- extremely cool. If you have a child who tugs on your sleeve and whines that he's bored, send him to read this book. It's perfect for summer downtime. Glenn followed up with Unbored Games, another volume that's often referred to in our house. 3. The New Way Things Work. David Macauley's book is famous and rightly so. This updated version includes 12 new machines but maintains the terrific illustrations and deep yet approachable explanation of, literally, how things work. For any child with an orientation towards engineering and the mechanics of things, this book is riveting. MacCauley tackles topics from sprinklers to papermaking to virtual reality, and every page is full of both humor and information.